Suspended ceilings are ideal for both the appearance and practical requirements of a modern business environment. Whilst providing sound absorption, light reflection and protection from spread of flame they also conceal unsightly cabling and pipe work. Over a period of time, damage, dirt, stains and age discolouration have an alarming effect on their appearance. Painting with emulsion can fill in the fissures and tile pattern, damage the acoustics and even stick the tiles to the grid. Most importantly, this process will invalidate a ceiling’s fire rating. Replacement, which is a valid option, is extremely expensive, time consuming and very disruptive to the modern day office environment. 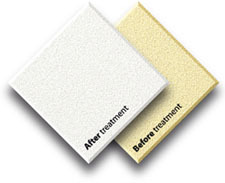 Innovative technology has developed the Artcote™ re-coating process.Mareted throughout the UK by Artcote™, this revolutionary process enables suspended ceilings to be restored to their original uniform bright appearance whilst preserving acoustic properties. The coating is 100% non-bridging, therefore retains and enhances the tile fissures and facia whilst ceiling void access is continued. Most importantly, the Artcote™ re-coating process has compared to replacement, the clean, quick and non distruptive nature of the process highlight its advantages over alternative methods. The complete process is performed outside working hours, allowing business activity to continue as normal. Staff remain undisturbed, as there is no requirement to remove office equipment and furnishings.